Knightsen has long been a railroad town, as a sign located near its heart clearly illustrates. But just as the trains bypass this tiny community on their journeys to or from the Bay Area, so to has prosperity. It may still be "God's Country," as the locals are fond of noting, but it will never be the bustling town that its founder John Knight probably envisioned in 1898. Those looking for some rail action here will find access easy. The BNSF mainline crosses two streets within a quarter mile of each other  Knightsen Avenue to the north and Delta Road to the south. In between there is a walnut packing shed, which serves as the sole rail customer. The siding is usually occupied by maintenance of way equipment or an occasional bad order car, but during the early fall one can occasionally find gondolas or hoppers here. A quest by some local leaders to land an Amtrak platform in town around 1994 died a predictable death. A small park tucked into a corner of the elementary school across the tracks features a retired Santa Fe caboose, which was donated to the town in the early 1990s. 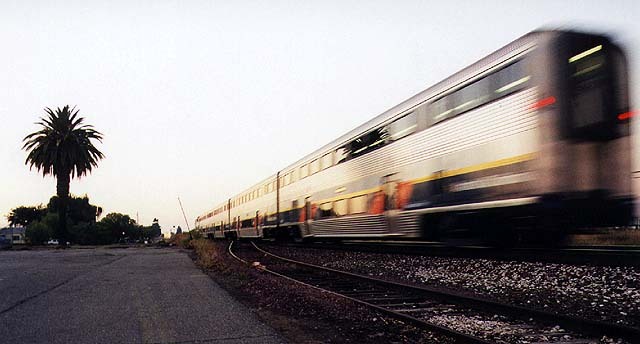 Amtrak San Joaquin Train 715 is a racing blur as it heads west by the walnut packing shed in early October 1998. Passenger trains make around 60 mph through town, although this one appeared to be traveling much faster. Photo by Glenn Gehlke.